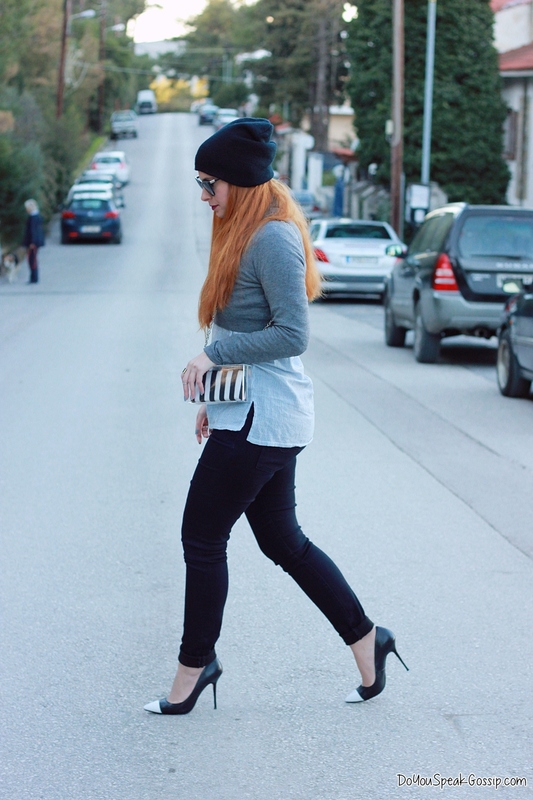 Style in winter | Outfits - Do You Speak Gossip?Do You Speak Gossip? As I promised here’s an outfit where I’m wearing my new Dune shoes which I bought recently. I wore it for a night out with my blogger friends and our boyfriends, and I really enjoyed it. The day we took these photos it was super sunny outside, and it looked like spring, but when we got outside, it was clear that it was still winter. It was really chilly without my coat on, especially when the wind was blowing, but fortunately we didn’t stay out for that long. Back to the outfit though… Do you like my new pumps? And what about the first combo with them? Because I seriously loved it, and I couldn’t think of anything better for their first outing. Όπως σας υποσχέθηκα, αυτό είναι ένα outfit στο οποίο φοράω τις νέες μου Dune γόβες που αγόρασα πρόσφατα. Το φόρεσα ένα Σαββατόβραδο που βγήκαμε έξω με τις φίλες blogger και τα αγόρια μας, και μου άρεσε πολύ. Εκείνη την ημέρα ο ήλιος έλαμπε και η μέρα έμοιαζε ανοιξιάτική, αλλά μόλις βγήκαμε έξω ήταν προφανές ότι ήταν ακόμα χειμώνας. Κρύωνα αρκετά χωρίς το παλτό μου, ειδικά όταν φυσούσε, αλλά έκανα υπομονή για λίγη ώρα για να βγάλουμε αυτές τις φωτογραφίες, κι ευτυχώς δεν μείναμε πολλή ώρα έξω. Επιστρέφοντας στο outfit, πώς σας φαίνονται οι νέες μου γόβες; Και τι λέτε για αυτόν τον συνδυασμό; Γιατί πραγματικά μου άρεσε πάρα πολύ και δεν μπορούσα να σκεφτώ τίποτα καλύτερο από αυτόν για την πρώτη τους έξοδο. Ω, τί όμορφες γόβες!!! Με ‘γεια! Με ‘γεια! Μου αρέσει τρομερά και το σκουφάκι σου!!! latrepsa ta papoutsia apo otan ta ida sto facebook kai isntagram! 🙂 poli omorfo outfit kai pali! latrevo ton sindiasmo pou black and white me to gkrizo! Se euxaristw poli Simoni mou! Kai egw ta agapisa apo tin prwti stigmi pou ta eida! Na’sai kala! πολύ ωραίες οι γόβες φορεμένες!! Βέβαι ομολογώ ότι ο συνδυασμός crop top και πουκαμίσου κλέβει την παράσταση!! Επίσης έχω να πω ότι μ’αρέσει πολύ το μανικιούρ σου…σε κανένα Beauty Sunday, δώσε κανένα tip!! Σε ευχαριστώ πολύ Άννα μου! Χαίρομαι που σου άρεσε ο συνδυασμός. Wow! So nice to meet the girls and their boyfriends! I bet it was a great time, especially because it makes winter warm 🙂 I think it really does – and it is good it was sunny, although cold outside, but a good moment to wear this beautiful coat! I like it very much! The sunglasses are super sweet and I also loved the shirt and the clutch, and wow, I loved the necklace and looked for the brand and it’s Amway! Cause I didn’t know they sold necklaces and I loved it! Well done! The combination is very sweet and beautiful with these beautiful jeans and shoes! I think you look very beautiful and also, I loved the location! Makia! We had a great time indeed! I’m glad you liked the look. Yes, I had gotten the necklace from Amway, but they’ve stopped having jewellery for a long time now. It’s an oldie from some years ago. They used to sell a few more things in the past like jewelry and scarves, or even some pjs. Thank you very much! <3 I'm glad you liked the look. I'm feeling so tired these days. I'll let you know when I'll have some peace and quite to write an email. Mine too! Thank you! Glad you liked it! Πολύ ομορφα τα μαυρο-ασπρα με γκρι!